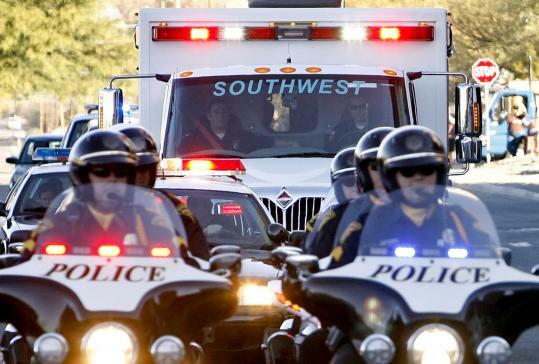 HOUSTON — Representative Gabrielle Giffords smiled inside an ambulance as she heard applause during a dramatic send-off from her hometown yesterday, and doctors said her transfer by jet and helicopter to a hospital in Houston went flawlessly. Throngs of sign-carrying well-wishers lined the streets in Tucson to wave and cheer. Friese and Giffords’s doctors in Houston spoke yesterday afternoon at a news conference at Texas Medical Center. Doctors said Giffords has a drain in her brain because of a fluid buildup, so she will stay in the intensive care unit for now. She will be moved later to the center’s TIRR Memorial Hermann rehabilitation hospital. Doctors said she would have her first rehabilitation session in the intensive care unit yesterday afternoon. She has “great rehabilitation potential,’’ said Dr. Gerardo Francisco, chief medical officer at TIRR Memorial Hermann. A gunman shot Giffords and 18 other people on Jan. 8 as she met with constituents outside a grocery store in Tucson. Six people died; all the other survivors have been released from the hospital. The suspect in the attack, Jared Lee Loughner of Tucson, 22, is being held in federal custody. Giffords had been making progress nearly every day at University Medical Center in Tucson. Kelly traveled with Giffords, along with her mother, a doctor, and other medical workers. A specially outfitted jet took her to Houston, then a helicopter took her from the Houston airport to Texas Medical Center, where she’ll be evaluated before going to the rehabilitation hospital. US Capitol police arrived Thursday afternoon to set up extra security measures at the 119-bed facility. Despite the steady progress, doctors warn Giffords has a long road to recovery. Doctors are not sure what, if any, disability she will have. She moves her lips, but it’s not clear whether she is mouthing words, nor how much she is able to see. “Not everyone always gets 100 percent restoration, but we help them to get to a new normal,’’ said Carl Josehart, chief executive of the rehabilitation hospital that will be Giffords’s home for the next month or two. Francisco, the hospital’s chief medical officer, will coordinate her care. “It’s going to be a very big team that will address different impairments, but they will have to work together,’’ he said. First, they’ll check her vital signs. Then specialists ranging from physical and occupational therapists to speech therapists and psychologists will conduct a slew of tests to see what she can and cannot do. They’ll determine the strength of her legs and her ability to stand and walk; the strength of her arms, and whether she can brush her teeth or comb her hair; whether she can safely swallow on her own; how well she thinks and communicates — not just her ability to speak but also to understand and comprehend. While she is moving both arms and legs, it’s uncertain how much strength she has on her right side; the bullet passed through the left side of her brain, which controls the right side of the body. Giffords will stay at Memorial Hermann until she no longer needs 24-hour medical care — the average is one to two months. Then she can get up to five hours a day of physical and other rehabilitation therapies on an outpatient basis, Josehart said. “It’s hard to speculate on the trajectory or course that any one patient will have,’’ he said.